This outdoor pumpkin pre-picked sales area is close to the parking lot. Stocked with a large assortment of pre-picked Tweite’s Blue Ribbon pumpkins, that are just awesome. 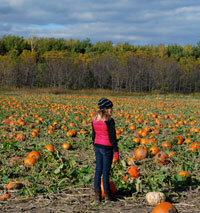 All of Tweite’s Family Farm’s pumpkins are home grown and are sold by size. 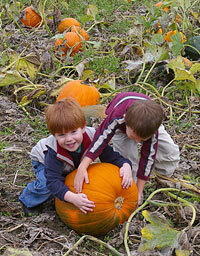 Or continue your stroll to the “walk to u-pick” pumpkin patch. Then you can search around to find the perfect pumpkin to take to its new home for the fall. Just use one of Tweite’s Family Farm’s handy dandy wagons or wheelbarrows to make your trip down and back to the pumpkin patch so much easier. Cash and Visa or MasterCard are accepted.